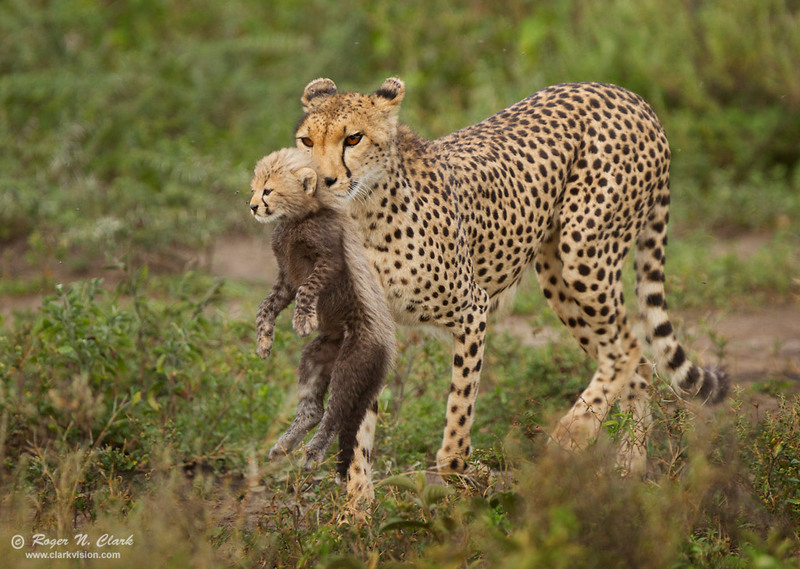 A mother cheetah was having a hard time keeping her cubs contained and in sight so she could protect them from danger. The cubs were frolicking and playing, running all over the place. This is very dangerous, as they became separated from each other and from mom multiple times. They could easily have been picked off by a predator. Fortunately, none were around and we had a long session watching them play. This image was made near the end of the play session when mom was carrying one cub back to a safe location. The cub is about 6-weeks old. Technical. Canon 1D Mark IV 16-megapixel digital camera, Canon 300 mm f/2.8 lens with 1.4x TC: 420 mm at f/4, ISO 400, 1/320 second exposure. Manual exposure. Slight crop.